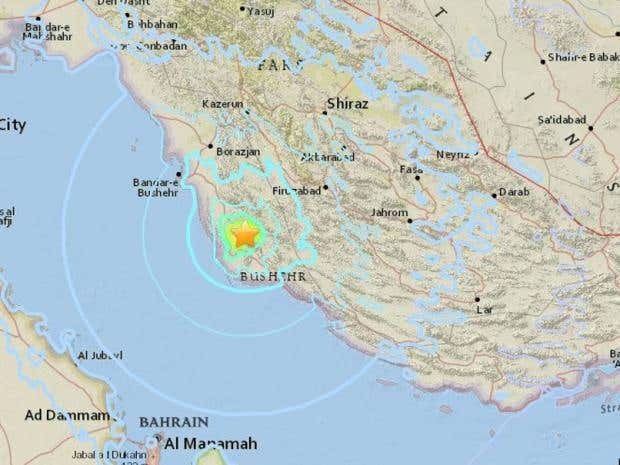 An earthquake has hit southern Iran just 60 miles from the country’s Bushehr nuclear power plant. It hit on Thursday morning and was also felt in Bahrain and other areas around the Persian Gulf. The US Geological Survey (USGS) said the quake struck at 6.34am GMT, some 60 miles east of the Bushehr nuclear power plant, the only operating nuclear power station in the Islamic Republic. The USGS put the earthquake’s magnitude at 5.5, while Iranian state television, citing officials, described the quake as a magnitude 5.9. Varying magnitudes are common immediately after a temblor. Government-run TV did not report any damage at the Bushehr plant, which has seen other earthquakes in the past and was built to resist damage from the tremors.